An amazing response to my Australian master classes, thank you guys cannot wait to come back over. In my sleep driven haze, (overslept due to a late night figuring out the bedroomÂ Iâve missed Pilates) but have just looked at the numbers for Oz and its incredible, thank you to everyone who has purchased tickets. I am determined at some point to openÂ a store in Australia; I could have a school, a store, a cafe, obviously a flower shop – the works. Its going higher up the to do list. Cannot wait to be back over in July! Talking of the to do list at the very top is the blasted bedroom. I’ve figured it out – and the answer is a simple one. No feature wall hereÂ it doesn’t work, itâs fighting too much with the wooden wall so itâs going to be painted out. Rather than hiding the fact that its a closet I’m going to put big fat gold door handles on the doors (which aren’t actually door handles they are wall hooks) and see if they work. They may not be very practical but that is the least of my problems. Today we have to peel off all the wallpaper (another one went on top of the tin tiles which I won’t even show you), sugar soap and paint out. Today in amongst a deadline schedule, a house to clean (cleaner is sick) and a work list that makes me a little dizzy that is! Back to my bedroom forget the work schedule! I think what is missing is some element of surprise (the reason actually I wanted a wallpaper on the closet wall). However rather than being so in your face about it I think I need to be more subtle in introducing an element of the unexpected. Am thinking some unusual shot of colour, and I’m thinking pink. 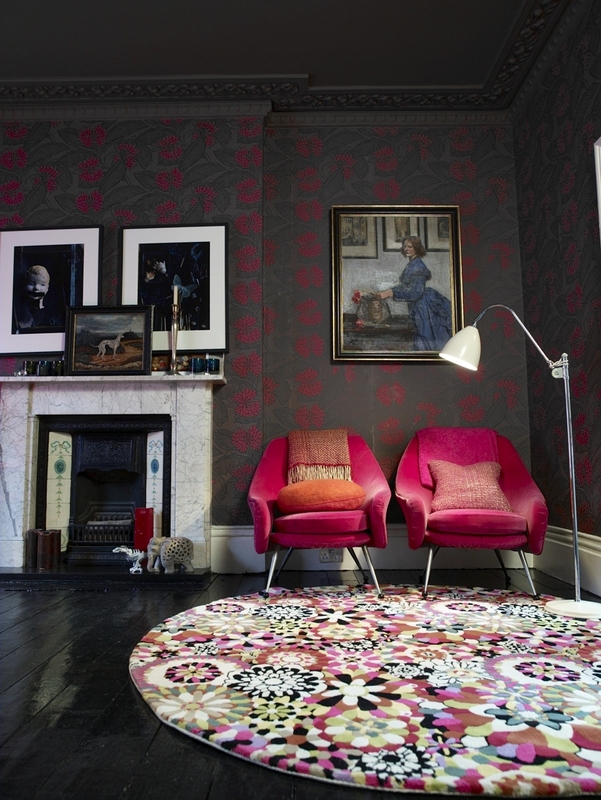 I’ve found this super cool velvet which might look fab covering one of my tub chairs its deep, its dark and its zingy. I think it will lift the space, trouble is I want it done now – wondering if I can do it myself – staple gun and a bit of glue can’t be that hard right! Some pink images to inspire – I find people are quite scared of pink. Me to if its wishy washy and pastel like – but when its deep dark and zingy then I’m in love! Also cool but I think I’m sticking with pink on the small stuff. 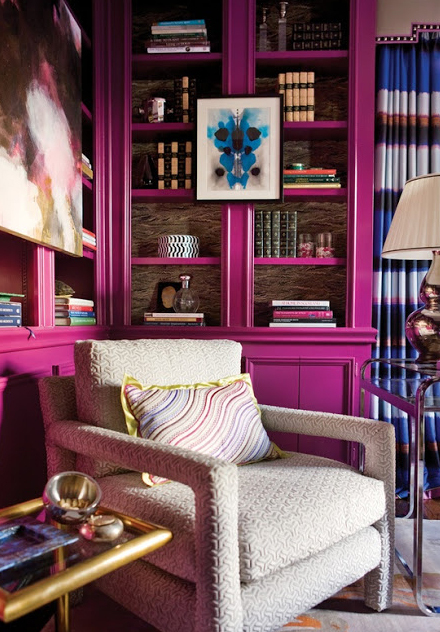 My point however is that when you go slightly off radar with colour no matter your style it lifts your interiors and takes them to a whole other level. Its a pretty easy decorating trick, you don’t need a lot of skill you just need a big bag of confidence!